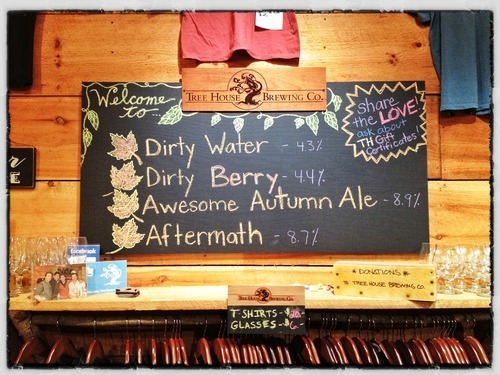 Tree House Availability, 9.8.2012 — Tree House Brewing Co.
As the green of summer gives way to more reflective autumn tones, Tree House will begin to release some beefier offerings. First up is “Awesome Autumn Ale”, our gigantic homage to nostalgic autumn flavors and sensations. At nearly 9% alcohol, the beer is crafted to be shared as a digestif to big autumn-centric dinners, or enjoyed on it’s own as a treat to finish a day’s hard work. Next is “Aftermath”, our massive breakfast stout brewed with tazo chocolate and fair trade organic sumatran coffee. This beer has a serious flavor profile and reveals notes of strong espresso, cocoa powder, and molasses. We couldn’t wait to share this beer with everyone since we first created it last June. So excited! Aftermath! As a Tree House release! Woo!! What else? Dirty Berry with Koran’s Farm Raspberries. This beer was steeped with six pounds of fresh raspberries hand selected at Koran’s Farm in Monson. It is an incredible ruby red color and the flavor is seriously tart, with only hints of the base beer (Dirty Water) remaining. This turned out super interesting and we can’t wait to share it. And finally, our old friend Dirty Water, the perfect elixir to wash down the crazy variety of beers we’ll have available this weekend. As always, we get started at 11 and close at 6. I would suggest coming early if there’s something that really catches your eye - for the last few weekends our beer has not survived the full day. Cheers to the days ahead with cooler weather and cozy wood stoves. PS - Sad days when we don’t have any pale hoppy offerings. I agree. But fear not! Julius (Citra) is going into kegs Saturday and should be ready next week. Also, a fresh batch of Green and Cascade are in the works and will be released in the coming weeks, along with “Local Nugget”, our all Nugget wet-hopped beer made with a friend/customer’s generous donation.